Like many Family History Societies, the North West Essex (Saffron Walden) Branch of the Essex Society for Family History (ESFH) transcribes old records so that the data is available for family historians. 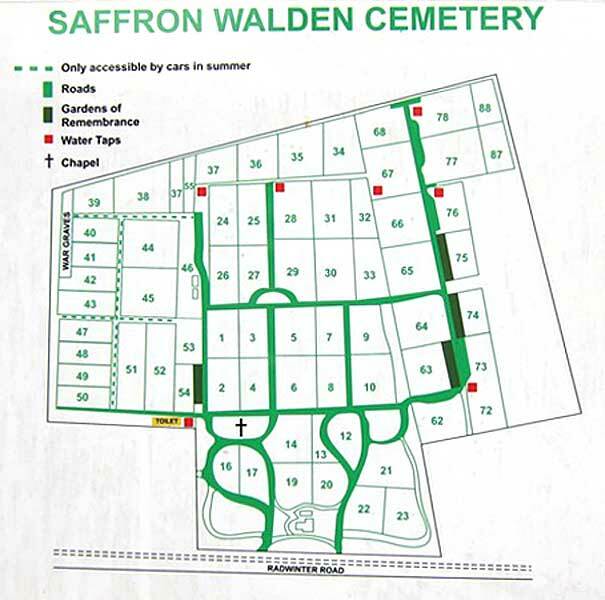 One such project was the transcription of the Burial Register Records for Saffron Walden Cemetery from 1857 (when it first opened) up to the end of 2002. Saffron Walden Town Council kindly made the later Burial Registers available to ESFH and the transcription has thus been updated to include all records (over 13,950) from 1857 to February 2017. The project allows local people as well as Family historians all over the world to find where their ancestors were buried even though the original gravestones may have disappeared. Since the Town Council now provide a search facility on their website this project is deemed complete. Although not alphabetical, for any burial, researchers can go here: http://saffronwalden.gov.uk/burials/ and enter the name of the person they are looking for. When an individual is found, click the MORE button and additional information relating to the burial will appear-this includes any personal data held. The transcription data was originally provided online at the Uttlesford District Council website but this service closed. The Essex Society for Family History are therefore very pleased to ensure that the transcription of the Burial Registers for Saffron Walden’s Radwinter Road Cemetery has been put back online at the SWHS website and the SWHS acknowledges with gratitude the sterling work of the Saffron Walden Branch of the ESFH for making the data available at no cost. In order to find the location of a particular grave, use the code letters given in the transcribed record and refer to the plan diagram of the cemetery. Where the situation is prefixed “CA” it means the cremated ashes were spread there. Where the situation is listed at 100, it means cremated ashes were spread in the small, un-numbered area adjacent to areas 21, 12, 10 and 62. The plan diagram seen below and downloaded by right-clicking and saving the image.